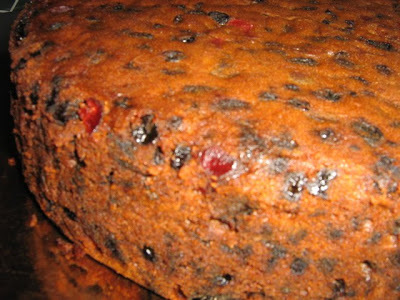 Some may remember my first-ever foray into fruitcake-making back in November when I got inspired by Deborah Strange Land and her grandmother's Christmas cake. 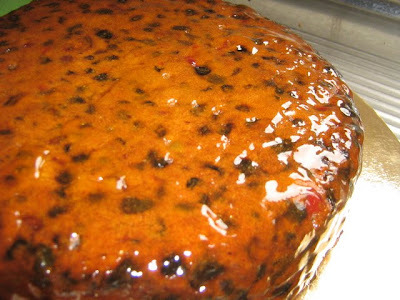 It came out better than I could have dared to hope, perfectly shaped and fragrant, and I wrapped it in layer upon layer of greaseproof paper and tinfoil, and took it down out of the cupboard every week or two to feed it more brandy. Came the day -- the 42 degree day -- when the decorating of the cake could no longer be put off, viz yesterday. I had been putting it off because the more I read about making and using fondant, the more difficult and fraught with dangers it appeared to be. But the fondant needed to dry for 24 hours before you could put anything else on it. So there was nothing for it but to begin with the icing-sugar mountain. 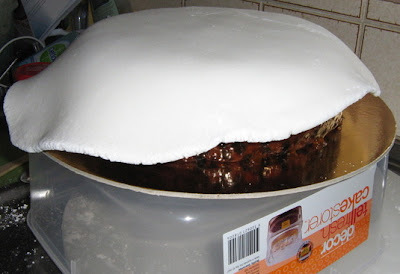 I did take a photo of the well in the centre of the icing sugar into which had been poured the dissolved gelatine, glucose and glycerine, but it looks just a bit too much as though a child has been peeing in the snow. I would have taken a photo of the kneaded lump of fondant, but it looked just a bit too much like a giant puffball. The giant puffball wrapped and put aside for the moment, the next thing was the preparation of the cake for its cloak of fondant. 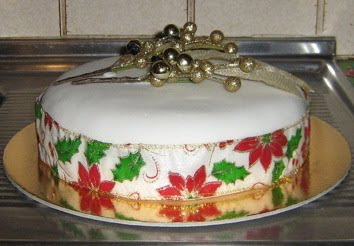 Part of the several hours' reading up on the subject of fruitcake decoration that I'd done was a suggestion that the top edge of the cake should be bevelled with a small serrated knife so that the fondant would not tear on the sharp edge. Sorry the focus is a bit doolally there, but this bevelled-edge thing is exactly the sort of detail one cannot possibly leave out of a blog post. Next, a concoction that the sainted Rose Levy Berenbaum, author of The Cake Bible (Her gingerbread cake! Her Piña Colada cake! Her buttercream! Her utter devotion to perfection!) 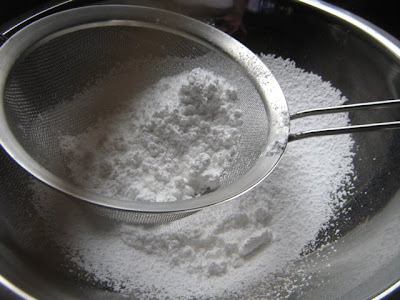 suggests as a 'crumb coating': something to seal the crumby surface of the cake so the crumbs will not come off into the fondant, and to provide a sticky surface for the fondant to, um, stick to. Berenbaum calls it Jewel Glaze, and so it is. 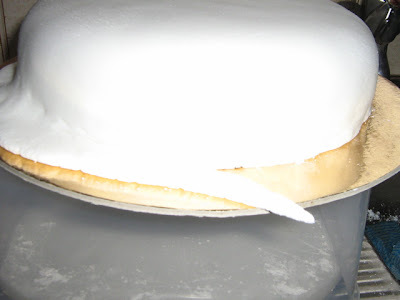 Next, you take the big fondant puffball, knead it a bit more to get it smooth and pliable again, and roll it out in a circle whose diameter is the same as the cake's plus double its height plus an extra inch of margin for error. This is where I started to think it really might all work; to my astonishment it looked exactly the way it was supposed to. As you can see, it's not called 'rolled fondant' for nothing. 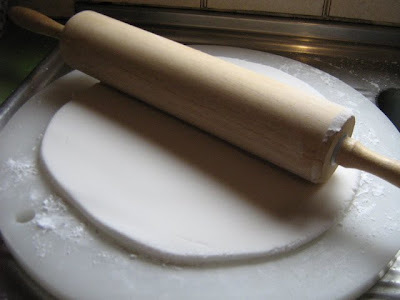 And then, as with the pastry for the top crust of a pie, you roll it up loosely around the rolling pin, position it carefully, and unroll it so that it drapes over the cake. This is only about four hundred times as hard as it sounds. And this is the point where, if you're going to blow it, you blow it all. You only get one shot. In this case, I could not have come any closer to the abyss without falling into it. C'est magnifique, n'est-ce pas? Observe cake plate elevated to near eye level so one can get at it and see what one is doing. Fondant, fortunately, is forgiving. This one does not stretch, but it is pliable -- we didn't used to call it 'plastic icing' for nothing -- and with a smoothing here and a coaxing there, a nudging and a bumping and a gentling of the fingers, it was made to shift a bit up one side and down the other, drape softly over the bevelled edges, fit snugly down over the sides, and generally do as it was told. Second most brilliant hint in my background reading: trim off the excess fondant with a pizza cutter. Finish trimming, admire handiwork, marvel at the fact that there seems to have been exactly the right amount of fondant, put cake in box and put box in wardrobe away from marauding cats, for the fondant to dry and set. 24 hours later, make a glue with icing sugar and water and use a matchstick to apply small dobs of it to sparkly things and cement them to cake. Allow to set. Take photo. And a very happy Christmas to all. Eventually, everyone blogs about cats and cake. Merry Christmas... and very classy skillz there PC. congratulations. what a cake. you should be proud, such persistence. Merry Christmas and may it be as wonderful as your cake. The cake looks stunning! Such perfect icing. Lovely photos too. Merry Xmas & may the eaters of the cake all be worthy and full o'praise. Mum and I have just been admiring your cake. It looks superb. We think we can smell its wonderful Christmas fragrance, all the way from New Zealand. Also, I put a fondant icing on Mum's cake (same recipe, of course) yesterday, and we cut it this morning. Bravo dear Still Life With Christmas Cake. It will be a breeze when you do it again next Christmas. Now have yourself some very merry christmas laughing at CakeWrecks. I am pleased and relieved to report that it tasted (and indeed still does taste) lovely. My dad was super impressed with the look of it, and super impressed all over again when he had a piece. Many recipes are, of course, dogs, and one must have the skillz to recognise a good one when one sees, erm, one. I availed myself of Deborah Strange Land's because it's clear from her blog that she is an exceptional cook and would only have blogged this cake if she had total faith in it. A recipe that has been proved annually over three generations of New Zealand women is a recipe that will not fail one. Ms O'Dyne, that Cake Wrecks site is hysterical. I used to do an annual Yule Log for the Melb U Christmas Party and I'm glad to say mine looked like proper logs. So pleased to hear you had The Time to follow the link. Nothing like a good laugh. releases endorphins. "it is a privilege to make up a bed for a guest" ... and so with food. Thanks for 'the contact high'. Happy New Year. The cake looks fab. I just watched Kings of Pastry which I recorded from SBS a couple of weeks ago. If you get a chance to watch it, do. It's the Olympics of pastry making and sugar sculpture. When one guy's sugar sculpture shattered I cried. The tension was amazing. A belated response to your Christmas cake. It looked wonderful and I hope it received all the praise your hard work deserved. "Saint Rose" is one of my favourites for when I get the urge to produce something to show off to family and friends. Because of the exactness of her measurements they all turn out well. I also have her Bread Book and one other which I can't remember or find, and met her in Adelaide some years ago when she attended a gastronomy symposium there. I enjoy your posts and had not caught up with them for a long time because I was spending too much time on the computer and neglecting my reading. This year (2010) I'm trying to balance both but don't know how I'll go. I made your trifle again this year and it was FABULOUS. You're the best for posting it. Oh, good! My sisters seem to have gone off my trifle (which they used to adore) for some reason and we just had mixed berries and cream (very nice and all, but still), so I'm really glad somebody made it.